The three chicks in Kalamazoo are active and playing a lot with each other. Play behavior in young animals is probably universal and teaches them the skills they will need to survive, such as evading enemies, catching prey, and maneuvering quickly in midair without flying into an obstacle (such as a building). Their training, given by their mother, Rebecca, is a remarkable and progressive series of lessons. She will initially fly with food in her talons to entice the youngsters to follow her (what teenager is not motivated by food) and they gain strength, endurance, and speed. She then gets them to take the food from her talons in flight (since she is not going to just give it to them), so they experience not only that transfer, but the new skill of flying and holding some weight in their feet. In the next set of lessons, Rebecca will drop the prey and the chicks will learn to catch it midair. 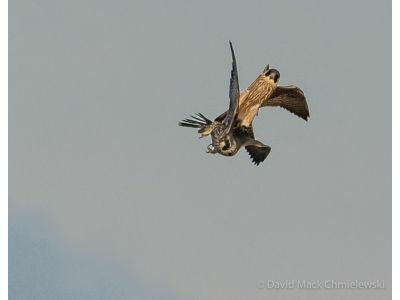 She has started to drop the prey from higher altitudes which forces the chick to go into the classic Peregrine stoop in order to fly fast enough catch up with the prey as it falls at the speed of gravity (32 feet per second). We have some preliminary good news from the Rehab Center about Checker. He was transferred to a flight cage today and has made some good flights across the cage. This may mean that his injuries were more soft tissue bruising than a fracture. He will be under observation for a few days and may be able to come home sooner than expected.